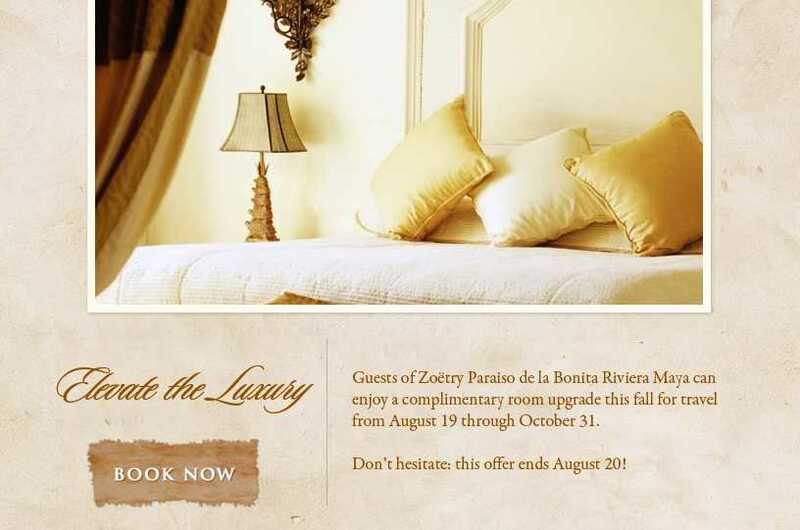 If a getaway to wellness, relaxation, and Endless Privileges® pampering is in the cards for you this fall, be sure to take advantage of Zoëtry Paraiso de la Bonita’s “Elevate the Luxury” offer. For a limited time you can book an Ocean Front Terrace room, for travel from Aug.19, 2012 through Oct.31, 2012, and receive a complimentary upgrade to an Ocean Front with Plunge Pool room. Talk about luxury at your fingertips. But hurry, this offer ends on August 20! Don’t miss your chance to elevate the luxury during your stay in the Riviera Maya. Click Here to learn more and book now. This entry was posted in Zoëtry Paraiso de la Bonita, Zoëtry Wellness & Spa Resorts and tagged Endless Privileges, free upgrade, luxury vacation, Riviera Maya. Bookmark the permalink.